Russky Island Bridge is the longest cable stayed bridge in the world. Image courtesy of УСК МОСТ. Russky Island Bridge was opened to traffic in July 2012. Image courtesy of m03g. Russky Island Bridge was constructed in preparation for the 2012 Asia-Pacific Economic Community Summit in the Russky Island. Image courtesy of Vladimir Kobzar. USK MOST was the main contractor for the construction of the Russky Island Bridge. Image courtesy of Vladimir Kobzar. Construction of Russky Island Bridge was undertaken through extreme weather conditions. SKMOST’s press images. Two production facilities were built for the construction of the bridge. Piers M1 and M12 of Russky Island Bridge are used as load transfer piers, which handle the cable stayed span stiffening girder. 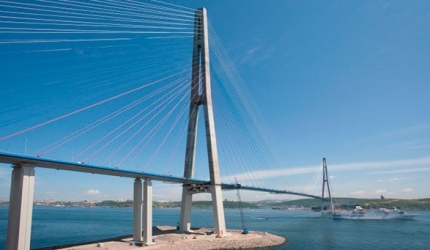 The 1,885m (3,887ft) Russky Island Bridge in Russia, inaugurated in July 2012, connects Russky Island with the city of Vladivostok. It is the longest cable-stayed suspension bridge in the world and reaches 70m above water level. The bridge crosses the Eastern Bosphorus Strait, linking with the mainland and island, home to around 5,000 inhabitants. Construction of the bridge was undertaken in preparation for the 2012 Asia-Pacific Economic Community Summit on Russky Island. Russia invested over $20bn in preparation for the summit, with the bridge’s investment alone estimated at $1.1bn. "Construction of the bridge was undertaken in preparation for the 2012 Asia-Pacific Economic Community Summit on Russky Island." The length of the bridge is 1,885.53m, and 3,100m overall including its viaducts, while four driving lanes line the bridge at a 21m width. The bridge has 11 spans, which include two at 60m, two at 72m, six at 84m and one 1,104m central span. The span decks are made of steel-inclined wall box sections, as well as a cast in-place reinforced concrete slab. The bridge’s pylon measures at 324m in height. The two anchor span structures, each 316m long, are located proportionately with respect to the central span and pylons. The steel stiffening girder of the central navigation span is made of two 6m-long transition panels, as well as 103 panels, each 12m long and 26m wide. The longest and shortest cable stays of the bridge are 579.83m and 135.77m respectively. Viaducts with a total length over 900m provide the approach to the bridge. Bridge piers M1 on the Nazimov Peninsula and M12 on the Russky Island act as load transfer piers. They handle the load from the stiffening girder of the cable stayed span, which is 1,248m long and made of two panels weighing 23,000t. The cable-stayed system has a total length of over 54km and weighs 3,720t. The cables are composed of 13 to 85 parallel individually corrosion protected strands, which in turn are made up of seven galvanised steel wires enclosed in high-density polyethylene sheathing. The Moscow – St. Petersburg M11 project is a 650km long toll motorway under construction in Russia. The motorway will ease the traffic and serve as an alternative route to the existing M10 Highway. Designated as Rossia, the M10 is one of the busiest highways in Russia running between Sheremetyevo International Airport and the city centre. Design of the bridge needed to incorporate the extreme climatic conditions of the area, which is affected by severe conditions, with temperatures varying from -310 to +370. In addition, storm winds flow with a velocity of 36m/s. During winter, 70cm-thick ice layers are also formed. Construction of the bridge was carried out in extremely challenging conditions. Two production facilities were put into operation, one at each end of the Nazimov Peninsula and Russky Island, which included office buildings, living quarters, canteens, mechanical and woodworking equipment repair workshops, a welding workshop, building laboratories and state-of-the-art concrete mixers. An existing 4.5km railway line was upgraded and a new 1,340m-long railway track built to ensure that raw materials for the construction are delivered on time. Highly advanced equipment was used in the construction, with unique Kroll tower cranes, of 40t and 20t capacities and telescope ability of up to 340m, used to erect the pylons. The channel span deck was installed using a Russian derrick crane, while the first ten sections of the steel span decks were fitted using a Liebherr Crawler crane. A manmade islet, constructed from 1.5 million cubic meters of rock and dirt, was used to carry out borehole drilling for the footing of Pylon M6 on the Nazimov Peninsula. The pile footing for the M7 Pylon on Russky Island was built using a temporary steel islet. Around 120 drilled piles of 2m width were put in place to build the footing of each pylon. 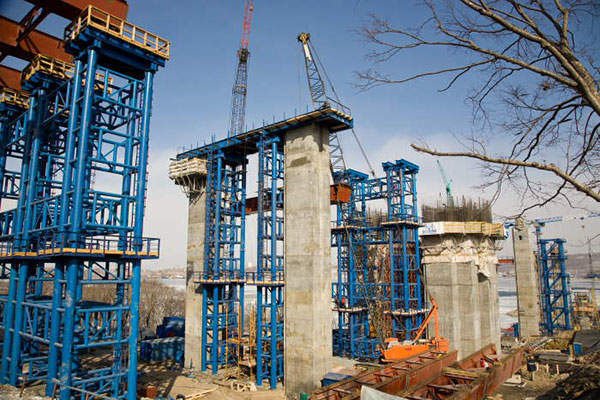 Viaduct piers were constructed with heights of 9m to 30m, with Geda express freight passenger elevator, with a load capacity of 2t and lifting speed of 65m per minute, was used for the construction. Around 20,000m³ of concrete mix and 3,000t of steel were used to construct each pylon grillage. Health conditions are monitored using strain gages that are integrated into the grillage body. The continuous span of the stay cables was constructed using 21,000m³ of pre-stressed cast-in-place reinforced concrete. "The bridge crosses the Eastern Bosphorus Strait, linking with the mainland and island, home to around 5,000 inhabitants." Various panels of the bridge were delivered to the construction site using barges and then lifted using cranes. The positioning of the barges at the appropriate installation site was carried out using GLONASS, a Russian global navigation satellite system, while the last panel was installed in April 2012, marking the bridge’s completion. USK MOST, part of SK MOST Group of Companies, was the main contractor for the construction of the bridge, while NPO Mostovik acted as the designer and subcontractor. Tecwill Oy and Compactors handled the state-of-art concrete mixing plants, with Freyssinet awarded the contract for design, manufacturing and installation of the stay cables, as well as positioning the dampers.